That is how Brig. Gen. Lowell English, the assistant commander of the 3rd Marine Division summed up his branch's rational for not wanting to fight for Khe Sanh. Unfortunately, Theater Commander Gen. Westmoreland felt differently - even years later, when he wrote his memoirs. "Khe Sanh could serve as a patrol base for blocking enemy infiltration from Laos along Route 9; as a base for SOG (Studies and Operations Group) operations to harass the enemy in Laos; as an airstrip for reconnaissance planes surveying the Ho Chi Minh Trail; as the western anchor for defenses south of the DMZ; and as an eventual jump-off point for ground operations to cut the Ho Chi Minh Trail." For him, fighting for Khe Sanh was a "simple choice." Intelligence - and a series of skirmishes leading up to the main battle - had correctly estimated that the People's Army of Viet Nam had massed large numbers of troops, ready to attack an area that was - from the US point of view - mercifully free of civilian population centers, allowing US firepower to be unleashed without fear. If that formula - encouraging the enemy to mass where firepower could destroy them - sounds a bit like Dien Bien Phu, it is even more ironic that the location was the site of an old French fort... and yet more so, since the Marine defenders were surrounded and threatened with complete destruction. Whether Khe Sanh would be the Dien Bien Phu for the Americans was decided in an operation covering 77 days, which saw "the most concentrated application of aerial firepower in the history of warfare" on the U.S. side, and one of the rare applications of PANV armor on the other side. That's right-tanks being used by the North Vietnamese. It's a complicated story. Fortunately, we have an expert to take us through it with a wargame. "Valley of Decision" has been called the "definitive" study of the Khe Sanh operation. The book is co-authored, by Ray Stubbe (a marine chaplain who served in the battle) and John Prados, who is known as an authority on the Vietnam War. He also is John Prados, the game designer who brought us "Campaigns of Napoleon," "Third Reich," and many other titles. 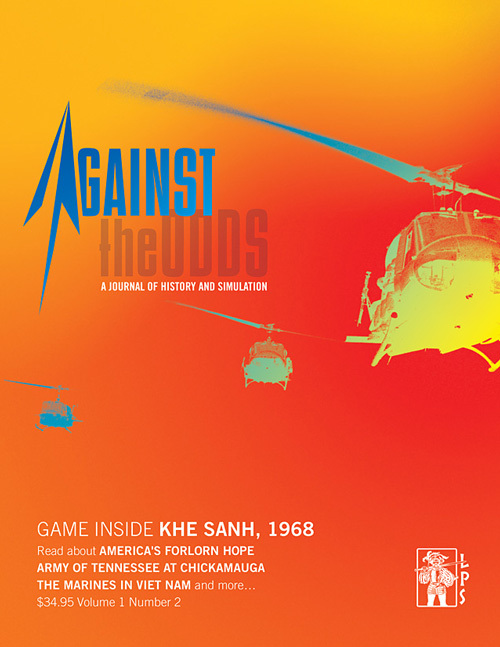 Prados' Khe Sanh, 1968, appearing in ATO #2, is winner of the Charles S. Roberts award for "Best Modern Wargame" in 2002. 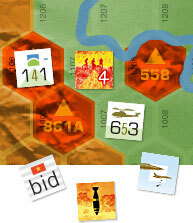 Extensive air and artillery rules, hidden movement by NVA, and a close interconnecting of combined arms and movement that gives players an appreciation for the challenges at hand. Units range from platoons to regiments, offering a "tactical formation" option that means they can shoot well and move slower or move better and shoot less. Battles are filled with such questions. See more Khe Sanh '68 map graphics (big download). See more Khe Sanh '68 counter graphics (big download). Download the new Khe Sanh, '68 rulebook (in PDF format). Download the new Khe Sanh, '68 charts and tables (in PDF format).